Several different software programs either support or plan on supporting the ePub format. The ePub format is an open standard for ebooks by the International Digital Publishing Forum. Since it's an open standard, anyone can make a program to read or create ePub books, and anyone can make an ePub ebook. I've reviewed several different programs that both read and create ePub books. If anyone is wondering where I hear about these programs, I primarily use two sources: Google, and Teleread. Also, lately I've gotten a few e-mails asking me to review a program, so I've reviewed those as well. Also, Wikipedia has a list of ePub readers for different platforms on it's ePub Page. Each program is given it's own review section with the review, how I scored it, and the date the review was updated, as well as a link to download the program. Please note that the focus of these reviews is on the programs support of the ePub standard. Other functions and uses of the software may be covered briefly, but is not the focus of this review. To test ePub format support, I open ePub books from nine different sources (noted below). The program is given a numerical score based on how many of the eBooks it can open. (If it can open only one of the eight books, it gets a 1, if can open all of them, it gets an 9.) There's probably a more scientific way to test this (using ePubCheck to ensure you're opening a compliant book for example, or making a list of ePub features and testing support for each of them. ), but I feel it gives a better feel for how the program performs under real-world conditions. Sadly, not every ePub book out there is going to be 100% compliant with the ePub standard; if for no other reason than the standard is being constantly updated, and you're still going to want to open old eBooks with your shiny new reading software. If you're curious about making your own ePub books, I have a tutorial here. Ease of use is a somewhat subjective score. I look for a few things in this category: how the program "feels", does it support bookmarks, does have an option to open back up where you left off reading, does it support multiple operating systems and hardware, that sort of thing. An overall score is then given based on the other scores, and adding or subtracting any additional pros or cons. New programs have been reviewed and old programs updated. I've also re-written the explanatory section, as it was getting crowded and confusing. Added reviews for Sony Reader Library, Nook, Lucidor, and EPUBReader. None of the programs previously reviewed have been updated except Calibre, a review of the latest version will be added soon. Note: I will not be reviewing any of the recently launched Google Books programs here, as this page is for reviews of programs that can read any ePub book. Gooble Books are in ePub format, and you can download a few of the titles, but the main focus on Google Books is storing books on the web and reading them through Google software. You cannot currently use Google Books to read your own books, or books from any other source, only books purchases through Google. Added a review of Bluefire. Updated the Azardi review for version 7. Added reviews for: CoolReader, Cobynsoft's Review, Ibis, and KooBits. Yes, I know that Calibre has had several new versions out since the last review. I hope to update it soon. First, there have been updates since last November. Check each program for the specifics on when it's review was last updated. A few reviews have been updated (Azardi, Calibre). Also, if you're interested in making or editing ePubs, I now have a Sigil tutorial available. 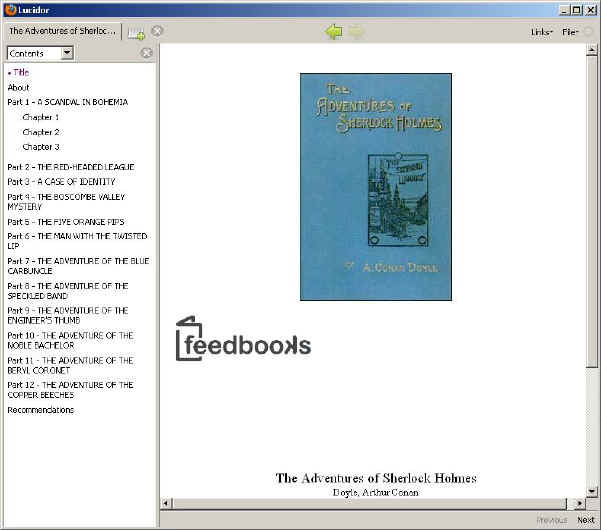 These programs can edit, create, or convert books into the ePub format. Of all the programs reviewed here, Digital Editions was the best at opening ePub files generated by any processes. And it has library management and book-marking features. The downsides are that the library management features are light on features compared to some of the competition. Possibly the biggest annoyance is also it's greatest strength: it's written in Flash. This lets the application run on almost any platform, updates are automatic, and it's easy to install. The downside of this is that you can't download the installer to install on other computers, you have to go to Adobe's website from each of them. Also, because of the Flash interface, it doesn't act like a regular program, and you have to have Flash installed to install Digital Editions. This last one isn't really a problem, almost everyone has Flash installed these days, but in principle you shouldn't have to install a whole different program just to install the one you really want. A few readers have pointed out that you can download a stand-alone installer here. Whoo-hoo! Someone at Adobe seems to listen to me... or everyone else has been complaining about the same things... The black-on-black is gone! I can see the interface! Also, menu bars have been added, a few right-click options are here now, and I think a few minor improvements in the already great navigation have been made. With the new version, about the only reason this program isn't a solid ten is the library management functions don't do as many things as some of the others (I can't correct meta-data for the books), and there's no mobile version. This is easily the best of the e-readers for most users. The interface for the new version looks much the same as the old one. 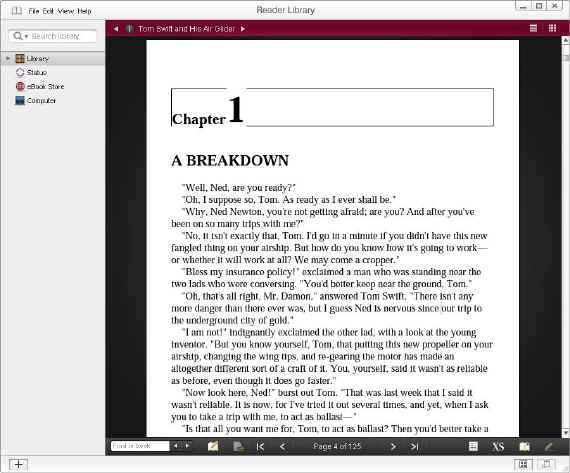 A lot of viewing formatting options have been added: You can now change the font size, indents, background color, and almost anything about how a book displays. In version 11 all the same options are there, but they've been condensed a little. Library management functions have been added, and it's now super easy to add books to the library (Just drag them from a Windows Explorer window and drop them on Azardi). You can also display the books in your library by title, or by cover image. Azardi reads the ePub metadata when importing books, so you don't have to type in anything, but you can edit the information if you want to before you add it to the library. 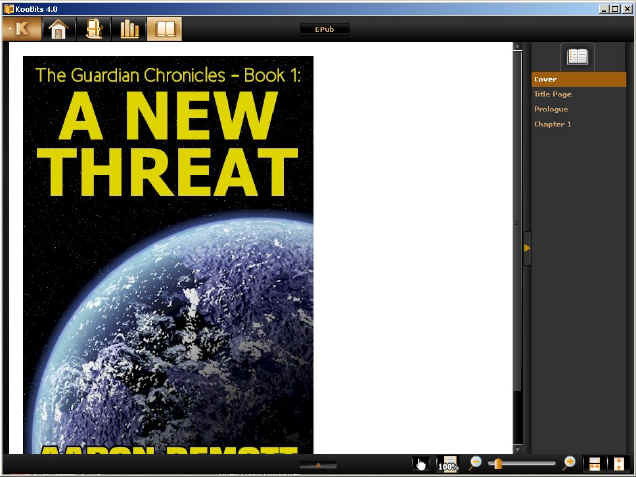 Version 11 adds a feature where you can read your books in the cloud - Much like Bookworm. 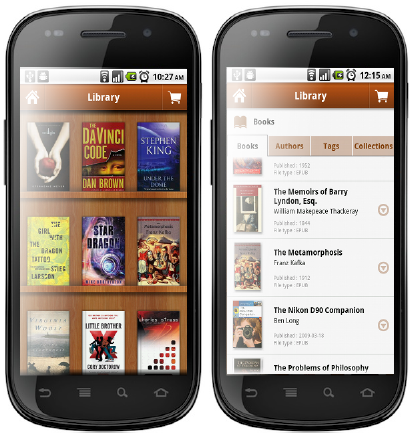 You upload your books to Azardi, and can read them wherever you have internet access. Azardi 11 was about the same as version 7 with reading files: it still had some issues reading a few files. Do note, however, that every file it choked on was either an ePub 1.1 file, or an ePub 2 file that didn't validate correctly anyway. In real-world use, Azardi should be able to read just about any actual book you come across, but it might have a few problems with older books. Specifically, it couldn't open 5 of the books in my test suite, and had a few display problems with some others. About those display problems: In the screen shot, you'll notice that the chapter name isn't centered. The book is formatted in CSS to center all H1 tags, and it look fine in Digital Editions, but isn't centered here. 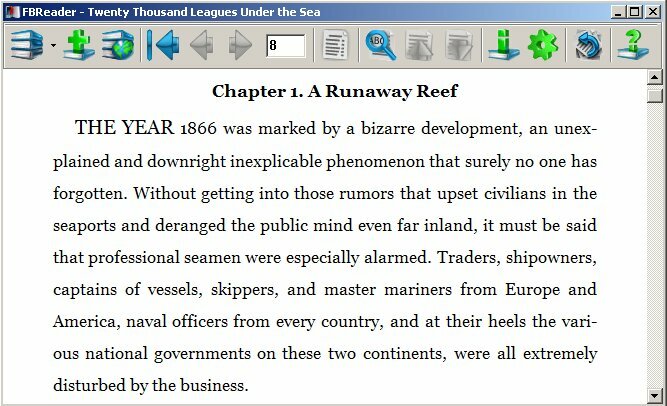 In one of the older ePub files I have (20,000 Leagues from Web Books) Azardi displays some weird XML stuff that isn't interpreted at the head of each chapter, but the rest of the book displays fine. What's this about the 10 in the format support number? Azardi is the first reader to read ePub 3 files. (Thus, Azardi is capable of reading one more file than is in my test suite of ePub books.) The only ePub 3 file I can find right now is on Azardi's website. Naturally, it looks great. At some point, I'm going to make my own ePub 3 file (and add a tutorial for it too...) and see how Azardi displays it. When I do, I'll update the review. I should also make a note that older versions were capable of editing ePub files. This feature has been removed as of at least version 7, and they have chosen to focus more on the reading experience, and it shows. The new version is much improved from the previously reviewed version. A note on DRM. You'll notice that Azardi does not support Adobe DRM. Instead, they've created a AWZ format for DRM'ed books. That's just what we need. Another eBook format. First, a disclosure. I don't have an Android device. A friend of mine does, and this review is based on mainly what she's told me about it. At some point, I want to borrow her phone and play with Aldiko for a while, then fill out the rest of the review. Aldiko (which I have no idea how to pronounce ;) ) appears to have all the standard features, library management, sorting, searching, and various reading options. From the screenshots, it looks very nice. My above mentioned friend likes it, and says she has no trouble finding or loading books, and it works great for reading books on her Droid. Aldiko also can read Adobe DRM files, and supports reading library books. It also allows you to add catalog sources, so you can get books from a variety of sources. One very nice thing that Bluefire does that none of the others that I've yet reviewed does is download Overdrive library eBooks. This isn't something I've yet had the time to try, but it's nice to have the option available. I'm confused. On Blio's website, they say Bilo reads XPS and ePub files. It doesn't though. The file open box only has an option to show XPS files, and the free books it downloads from Google are saved in XPS format. So, as of the version noted, no matter what you read on the web, Blio does NOT read ePub files. As of 9/18/12 (and possibly sooner) Bilo's website now doesn't mention reading ePub files at all. It's just one more store that sells books you can't read anywhere else. iBooks on the iPad is a really great experience. It's snappy and responsive, the books look great, and all that flashiness really doesn't get in the way. One thing I really want to talk about... the screenshot at the right. It shows the books in a pretty shelf... this really concerned me before I got my iPad. It looks great, but I have hundreds of books, and finding them in that could get messy. Great news! You can turn it off and just show a list of books! You can also sort by author, genre, title or bookshelf. One thing that I don't like, compared to how Stanza does it, is the sorting by genre. 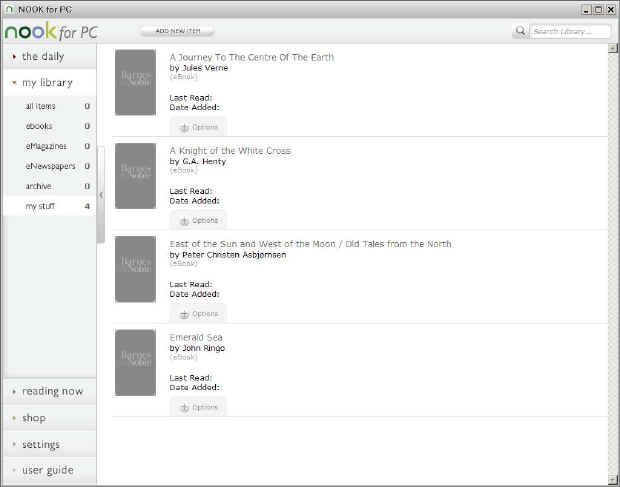 In Stanza, you can show all your books, or just say, the Sci-Fi books. You can kind-of do this in iBooks, but you have to move all your Sci-Fi books to their own shelf, and they no longer show in the master list with everything else. Another note on editing meta information. iTunes makes it as easy to change the author, genre, title, whatever of your books as you do your music... the downside, you have to do this on your computer and they sync, you can't edit it right in iBooks. 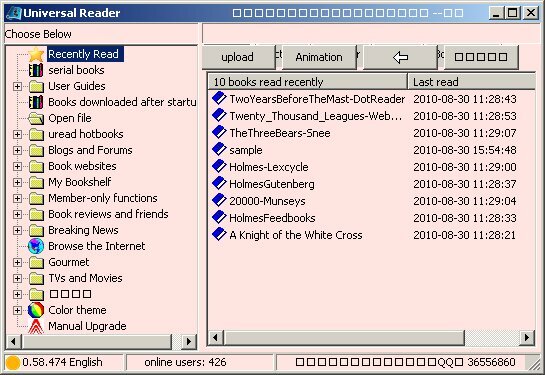 CoolReader is just a zip file download. Download, un-zip, and run the exe, that's all there is to setup. Surprisingly, it even opened the ePub 3 file that I got from Azardi's website. It didn't display it properly, but it tried, and you could see most of the content in it. The stylesheet tab. Here's where people that are nitpicky about customization will think they've died and gone to heaven. If you know even a little about CSS, you can change EVERYTHING about the way the book looks. The real beauty about the way that Cool Reader does this though, is that if you don't know or care about all that crap, you don't have to touch it and you can just read your books. I've ranted about the war between "scroll readers" and "pagination" readers in other reviews, and CoolReader is the program that works for both types of people. There are only two things standing between CoolReader and a "most recommended" rating: lack of library management features, and the fact that it didn't perfectly open every book in my test suite. If your like me, you have all your ePub files sorted into folders by genre or artist or something anyway, and don't really need library management, but some people do. And let's be honest here, asking a reader to open every file in my gauntlet is asking a lot. I've got deliberately bad ePub documents in there... in real-world usage, you'd either have all good files, or you should fire up Sigil and fix them anyway. FB Reader opened all files without errors, but displayed some images and headings differently than the HTML said it should be handled. An OS X build has been contributed, and a few minor updates have been released. Still no support for ePub table of contents. Version 0.8.17 is now out. There haven't been any ePub related updates since the reviewed version, so I won't do a new review yet. The updates consist mostly of bug fixes and support for a few more platforms. Well, I've updated the format support score for FBReader. I don't quite know how to score this one. Most of the other programs either would open a file, or not open a file (some with minor formatting errors, but if it opened it, all the text was there at least.) FBReader will open every file in my test suite. Some of them (my file, and the one from Adobe's site) it displays perfectly. Others (Notably, the one from Web-books), it only displays one chapter from the book, the rest of the book is just not there. One could argue that only test books that pass epubcheck verification should be tested, but as the standard evolves there will be books based on the older spec out in the world. A reader program should still be able to open these books. Several new versions have been released, but nothing major has been added or updated. Mostly bug fixes, minor tweaks, and improved mobile device support. Ibis looks like a flashier looking version of Bookworm, and functions about the same, with a few more choices of book feeds. The options to download your books to your device are still there. It looks a lot like Bookworm, actually, just more red and less yellow. There's also a "No distractions" mode that gets rid of all the red, and logos, and most of the menu options, leaving you with a nice white screen and just your book (with a few navigation controls.) It's easy to turn this mode on and off, and it's a nice feature. Openberg was able to open all types of files thrown at it. The low score comes from the cons listed above. Since Openberg is a plug-in for Firefox, it brings with it certain advantages and disadvantages. 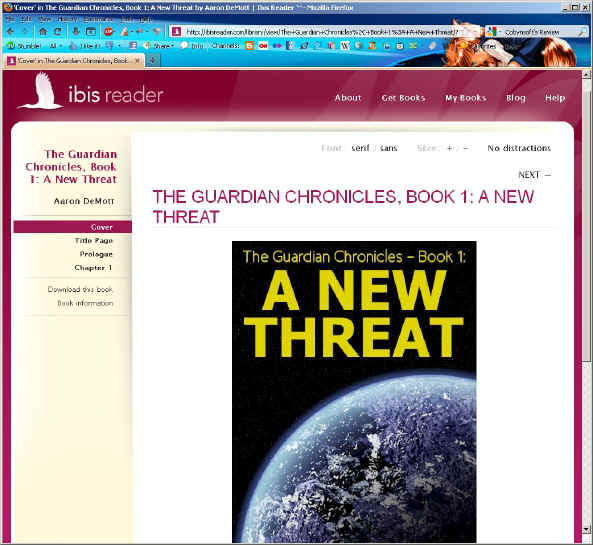 If you're surfing a web site that has a link to a ePub file, the file opens in the browser and you're off and reading. This is a great thing from a usability standpoint, but there are problems with the approach, as noted above. It looks like the Openberg site is gone now, but it's available as a Firefox add-on at the Firefox website. It doesn't look like there's a new version out though. At this point I would encourage everyone to use EPUBReader instead of Openberg. Wow, for being a web app, this program is packed with features. I honestly wasn't expecting this much out of the program when I installed it. The Table of Contents support is better than in some of the dedicated eBook readers. I also want to comment on the the "No mobile device support" con. By that, I mean that it doesn't support syncing to any dedicated e-reader software. According to the webpage, it will however, run on devices that run mobile Firefox. As a note, this extension installed and ran fine on OS X, but not on Windows in my virtual machine. I am fully satisfied that this is some weird glitch on my part though, and not a fault of the program at all. KooBits has an excellent library manager where it's not only easy to add your own books, but to organize them as well. You can also view metadata about the book from the manager. The thing I don't like about KooBits is the lack of single-key page turning. I know, it's a big debate, and some people really like to scroll through books (for reasons that I don't understand...). Given the polarized nature of this argument, one would think that most of the book reader developers would have something in settings to either scroll or page through books, but this isn't the case. The problem that I have with KooBits implementation of scrolling though, is that it feels awkward to navigate. When you get to the end of a chapter, you have to click the next chapter in the TOC pane, it doesn't auto-load the next chapter. KooBits also doesn't seem to support book covers in the same way that other readers do. I know it supports them somehow, as the books in the store all have covers, but it didn't load a cover for any of the books in my test suite (not all of them have a cover, but most either have an image on the first page, or an image named 'cover.jpg' on the first page. Most readers display this image as the cover). Also, it couldn't display the author information for the books that had it; and the books that have it, have it in the metadata as per the ePub specs. There were also some issues with displaying headers that are centered in the CSS, but not displayed centered in the reader. Overall, I'd really recommend KooBits IF you like to scroll though books. Other than that, it does a good job, just missing features compared to others. The biggest one is single key page turning. I REALLY like to turn a page by pushing a single key when reading a novel, scrolling just detracts from the book too much for me. Lucidor does have a "Next" button at the bottom of the screen, but this brings you to the next section. If each chapter is in a different file in the container (which is the recommended practice) then you have to scroll through that chapter, then press the next button to get to the next chapter. Lucidor's website appears to have disappeared. The link above now goes to a 404 error, and if you go to the web root, you get a blank page. As far as software goes, this is hands down the best one of the bunch. The interface, number of features, ease of use, and platform support FAR out-classes anything else in this review. Version 6.2 is out, and I've just downloaded it and put it through it's paces. I've imported a handful of ePub books with this version and haven't had a single error. I've been able to import multiple books in a row, and all of them imported without any errors. All the books made it into the library, and I was able to open all of them. All CSS and images and such appear to display properly. The only real problem I have with Mobipocket now is that the ePub table of contents does not display properly. In all of the books I imported, none of them displays the table of contents. 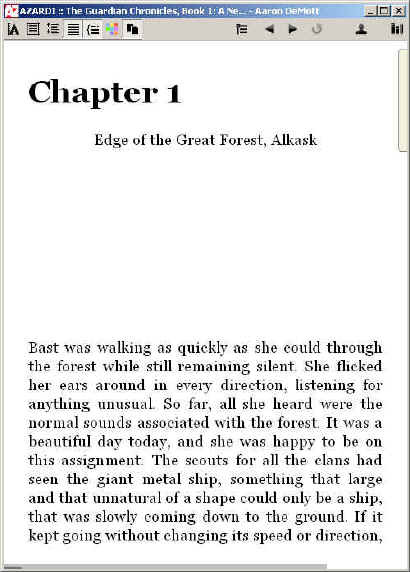 The "Content" button only displays "First Page" for all ePub books. This probably isn't a big deal for fiction, but could get irritating for other types of literature. I also have a very small pet peeve for version 6.2: You can only import one book at a time. This wouldn't be such a big deal in daily use, as I don't usually download that many new books at once, but when I have 190 ePub files to import, it gets to be irritating fairly quickly. I have heard that Mobipocket can import multiple ePub's at the same time. You have to select them in Windows Explorer, and drag them onto the Mobipocket window. The Nook software is about what I expected. It reads ePub files. The PC app feels almost like an after-thought, like they designed the Nook device and said "Hey, we need a PC application to sync with". Don't get me wrong, the Nook PC app opened every file, there's bookmarking support, TOC support, and single key page turning, it's just not polished. I will say the iPhone Nook app is much better as far as features and reading experience go, but it's still not any better as far as loading your own content. For example: In most of the readers reviewed here, all your books are stored in the library. In the Nook, the books you import are kept strictly segregated from the book you buy from the Nook store. That could really irritate me if I imported all the books I already have, and bought several hundred more, then had to try to remember where I got a certain title I was looking for from. Other examples of the little things that bug me: Two pages of your books get displayed at the same time on the screen, and there's no way to get it to only show one page. Lack of a standard menu means you have to hunt for commands... and some of them are hidden. The option to import your own books, for example is right at the top where a menu or tool bar would be... but only if you have the "My Stuff" tab selected, other options show up in that space if you're on another tab. You get used to it, but it's strange. Also, there are no note taking capabilities. And finally, where have my cover images gone? The bottom two books in the screen-shot both have cover images as the only thing on the first page of the book, yet, nothing. Perhaps a version or two later I could really like this program though. I like the idea of seamless reading no matter what device you're on. Start a book on your computer, read more on your Nook, and finish on your iPhone. As of right now, Nook supports more devices than anything other than FBReader or Kindle, and Kindle doesn't support ePub. This program had trouble with almost all the ePub files I tried to open. It will open some, but won't open the ones from Adobe's website or Feedbooks.com. It will open some hand-created files, but not others. I think the reason for this that Digital Editions uses an .xpgt file for handling layouts that isn't in the spec, and I think dotReader is choking on it. What should happen, is if the software sees something that it can't interpret, it should ignore it. All the other readers in this review do that and open the files fine. It also had problems displaying some images and headings as the HTML said they should be handled. The dotReader website appears to gone away, but you can still find a copy floating around on the web if you search for dotReader. This is another program I wasn't expecting much out of, as the first few versions of it did little more than sync with the Sony Reader and weren't worth reviewing. The current version has a full feature set, and it's not a bad experience reading a book in it. The interface is just a little weird. By that, I mean that the left column where you would normally find the Table of Contents is taken up by a combination Library Management/Syncing/Bookstore pane, and the TOC is accessed from a button along the bottom toolbar. It'd be nicer from a "reading on the computer" perspective to reverse those. On the other hand, if you have a Sony Reader, you'll most likely be doing most of your reading on that anyway. Speaking of the toolbar, I'd prefer it along the top, and there isn't a way to move it. I want to take a moment to talk DRM here. I don't like to do this for most of the reviews, as this part of the website is dedicated to the ePub format itself, but I feel I have to mention it with this one. One of the big battles at the time this review is being written is which dedicated eBook reader device is going to win. At the time, Kindle has a big lead with a lower price point and Amazon's muscle behind it. Kindle can't read ePub though. 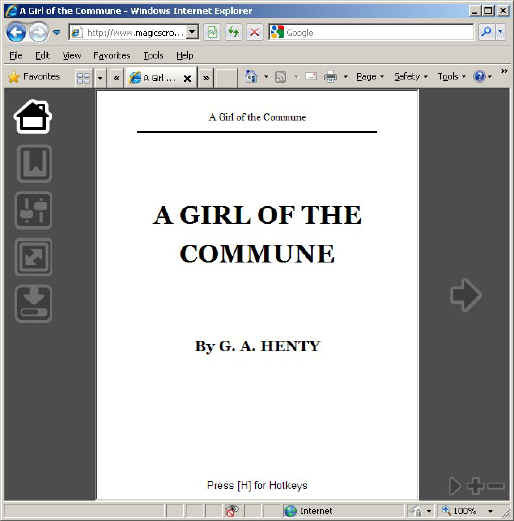 Sony Reader can. The short point of this long paragraph is to point out that yes, you can load your own non-DRM'd eBooks that you got from anywhere you want and read them on your Sony Reader. You can also read any book that uses Adobe DRM no matter where you got it. I feel that this will become important later on once eReading gets bigger. New version is out, but I haven't reviewed it as about the only thing that's changed is cloud sync has been added. This keeps your same position in your book on all your Windows PC's and Sony Readers. Near as I can tell, it only works with books purchased from Sony. If you have an iPhone (or an iPod touch with the latest software update), you can download Stanza reader for it. The interface is very nice. Library management is built in; you can display books by: Title, Author, Latest Read, or Latest Downloads. You can also create custom categories and put any loaded books into them. Page turning works by swiping your finger left or right (or tapping the edge of the screen). There is a small (1 to 2 second) delay when changing files inside a book (in most ePub books, different chapters are in different files inside the ePub container), but none when changing pages in the same chapter. ePub support is excellent. Stanza opens anything I throw at it, it supports the TOC, and they've added bookmarks since I've first reviewed it. 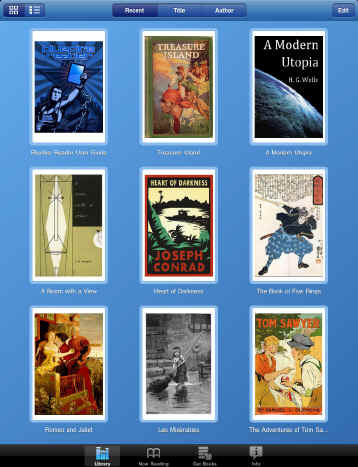 Stanza loads books onto your iPod/iPhone, and you can read them off-line. If you want public domain books, it couldn't be simpler to load them. Go to "Online Catalog" then "Feedbooks" (or any of the other free or paid catalogs) and start browsing. The book is downloaded when you click it's title. Loading titles from your computer is almost as simple. Bad news, the desktop version of Stanza has disappeared completely. I'm bummed about this. 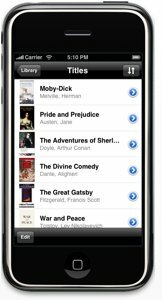 I loved the app for uploading books to my iPod, and creating ePub books. It was a good desktop reader as well. I do wish they wouldn't have had it time limited so I could still use my beta copy. The good news is the iPhone/iPod Touch version is better than ever. Nothing else I've tried (that means anything free) for the iPod has even come close to being as nice and versatile of a reader as Stanza. Every feature has been improved. I just want to cry. Amazon bought Lexcycle, and, surprise, surprise, Stanza is now dead. It has been updated to run on iOS 5, but the developers have said this is the last time it will be updated. 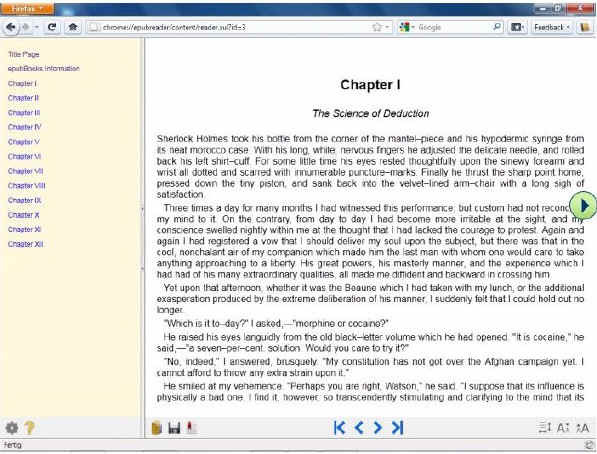 Books are not split into "Pages"
Bookworm is an online ePub reader. You upload your own files, and are then able to access them from anywhere with an internet connection. Bookworm also does not share your library, so you can upload non-public domain files that you own without breaking the copyright. And yes, it works in Internet Explorer, Firefox, and Safari. It most likely works in any other browsers too, but those are the one's I've personally confirmed. When I first reviewed Bookworm, I had trouble uploading and reading some books that did not perfectly meet the ePub specification. 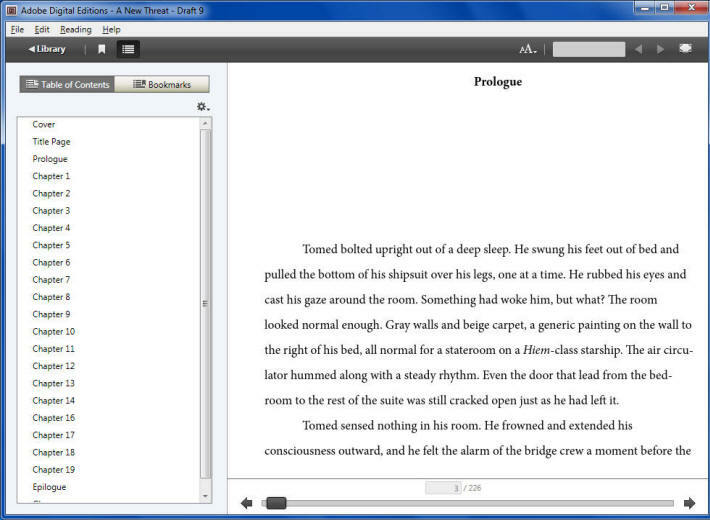 Bookworm has since been updated to better handle non-perfect ePub files. It now opens almost everything without errors. Some books that epubcheck returns a list of errors on still won't open, but that's hardly Bookworm's fault. Bookworm loads books one file at a time, so if each chapter is a separate file within the container, each chapter will be loaded one at a time and give a link to the next chapter. If the chapters are all within one file inside the container, they all get loaded at once. It should be noted that the "Remember what chapter I'm on" feature doesn't work correctly in this case. Note: This has been fixed since I first reviewed Bookworm. It now properly splits out these books into their chapters, and remembers where you left off reading. The ePub TOC is displayed in a column along the left hand side of the book for easy access at any time, and highlights the chapter that you're currently reading. I like the idea here, you can upload your books, and get to them anywhere you go without having to bring anything with you. Also, the implementation is very well done, the interface is nicer than some of the desktop readers I've reviewed. Bookworm's greatest strength however, is also it's greatest weakness. If you don't have an internet connection, you can't get to your books. This is, however, the perfect tool for taking your own book collection anywhere that has an internet connection. Another note, I've heard from a visually impaired reader that Bookworm works the best for screen reading programs, if you click the link that says "toggle reading mode". I just got an e-mail asking me to review magicscroll.net, so here goes. My first thought, before even checking it out, was, "I wonder how this is going to be similar and/or different from Bookworm?" The comparison is apt, since both are on-line ePub readers. There are a number of feature differences though. One of the things I really like about Magic Scroll is that it works more similar to desktop readers, in that the book is loaded as a single page that you press a key or click a button to turn the page, as opposed to one long page you have to scroll through. 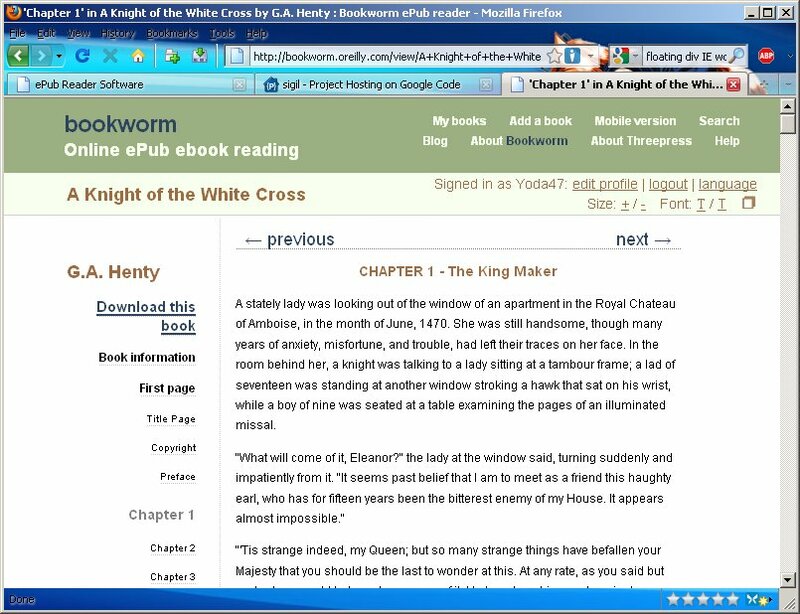 Magic Scroll lets you load books from your hard drive, or another web site, and it lets you re-download them to your computer at any time. There are a number of different settings and viewing options. One of the more unique things about Magic Scroll is, as the name implies, it can automatically scroll through the book for you. This isn't a feature I particularly need, or would use, but it's nice to have there for those who do like it. It works well, and you can turn it on or off as desired. There are only two things I don't like about Magic Scroll. One of them is a minor irritation, and the other isn't even it's fault. First, it choked loading a few books, but to be fair, they were some of the older ePubs that won't validate (I keep them around just to torture reading programs), so I can't really count that against it. As I've said before, a book should validate, but that doesn't mean that every readers books will, or that every reader will know how to fix their books that don't validate. There was only one one book that it couldn't read at all, most of the others it loaded, but didn't display the "Home" or "Contents" buttons. It couldn't read the contents because those books didn't have a TOC.ncx file (It's recommended in the ePub 2.01 spec, but not required.) I'm not quite sure why the home button went away as well, but I could still read the book fine. The other thing I didn't like is also a thing I do like. Let me explain... I like the concept, just not how it works. The feature I'm talking about is "Online Syncing". There's a button in the upper right-hand corner labeled "Enable Online Syncing". When clicked, it asks for your e-mail, and sends you a code. This is how you "login" to the site. It remembers your session, but if you clear your cache, history, cookies, etc, or login from another device, you have to enter your e-mail, check it, and get and enter the code to get to your books again. It works, but it's a little different. Once you get this figured out though, you can get to your books from anything with a web browser and access to your e-mail. Oh, did I mention it syncs where you left off reading? Because that's really cool. Probably the biggest problem is that it's developed in Chinese, so the English implementation has some display oddities (the squares in the screenshot). Still, they write English better than I do Chinese, so I can't fault them for it. first gen iPhone/iPod Touch: Stanza or Bluefire Neither of these work anymore, as the apps have been updated. Stanza will still install, but crashes upon opening. I want to give a special mention to Bookworm here. Over-all, it was narrowly beat out by the above programs by the smallest margin, but if you're anywhere with an internet connection (a friend's house, the library, or other public internet terminal) Bookworm will still let you get to your books. In the future, I could easily see Mobipocket, CoolReader, or Azardi become my top choice with a few minor improvements. I want to make it clear that all of the programs I've found so far are very nicely done. If some of them would add TOC support and improve support for CSS I could wholeheartedly recommend any of them. Note for Linux reader software: I replaced the power-supply in my linux computer, but I haven't yet re-loaded linux onto it yet. Please consider donating a small amount to help pay the server costs. You don't have to, but if you would like to, I'd be very thankful!